I have a massive fascination for the Chain Pier. No idea why, just one of those things I guess. I would love someone to rebuild it one day. For years I heard at very low tide its remains could still be seen, but never quite got around to go and look for them. In September 2009 I decided to go on a hunt for them after studying many photos to make sure I'd got the right location. I was so excited when I found them (I know, weird!). The Chain Pier was built in 1823 by Captain Samuel Brown. Originally built as a landing stage for package boats to Dieppe. It was a popular promenade with a camera obscura. Also still existing somewhere is the sundial seen in some of the pictures of the Chain Pier. The Chain Pier was due to be pulled down after the building of the Palace Pier, however there was a huge storm in December 1896 which completely destroyed the Chain pier. The toll booths from the Chain Pier were saved and placed on the new Palace Pier as was the cannon from the Chain Pier. As I couldn't possibly have been there to take this photograph myself. Here is a photo of what the Chain Pier looked like. At the time I didn't appreciate how lucky I was to catch such a low tide. These remains are not often visible as I have been back since and they have been covered over. So here they are , the remains of the Chain pier. 1823-1896. R.I.P! Photographed in September 2009. Just a mere 113 years later! For a brief moment in time Brighton had three piers. The Chain Pier, the West Pier and the Palace Pier. 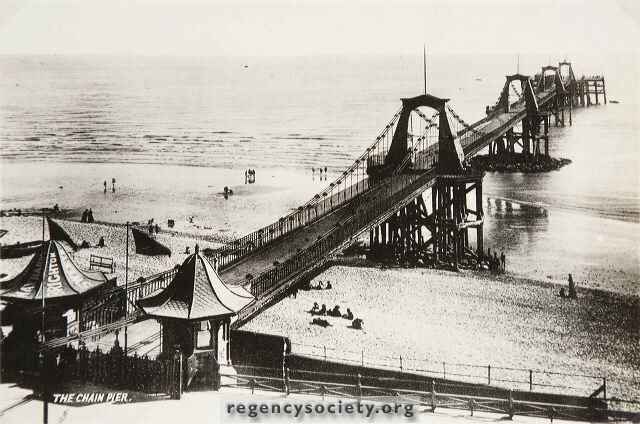 The Palace pier was built to replace the Chain pier and the building of it started in 1891 five years before the Chain Pier finally collapsed. A lot of people think it was built in the same location as the Chain Pier when infact the Palace Pier was built slightly to the West of the Chain Pier about two beaches apart. The picture here shows the remains of the Chain pier and the surviving Palace pier and remains of the West Pier in the background. September 2009. The remains of the second set of pylons of the Chain pier in the sand looking towards the arches in the wall behind where the chains would have been embedded. Beyond that is New Steine. A view looking towards New Steine from the second set of pillars. The tips of the remaining stumps from the third set of pillars of the Chain Pier, just visible above the water. The fourth set were just visible also. Not the best of photographs but a relevant one. In the water can be seen the tops of the remains of the third set of pylons of the Chain pier. The remains under water are visible on google earth if you have a look. Remains of the second set of pillars from the Chain pier. A close up of one of the stumps from the second set of pillars . A close up of the remaining stumps from the second set of pillars. The signal cannon from the Chain Pier. Now to be found towards the end of the Palace Pier. The commemorative plaque for the Chain Pier. This is where the chains from the Chain Pier were embedded into the East cliff. One of the two remaining toll booths from the Chain Pier. Now in place on the Palace Pier. Chain Pier House. Marine Parade. Once home to Captain Samuel Brown who created the Chain Pier. I havent seen the remains visible for a few years but was very glad to see them on show again this February. One of the lowest tides of the year. One of the years lowest tides. Sadly the remains at the shoreline weren't visible but the tide was so low you could see many of the remains of the third set of piles.